"This Muslim ban 2.0 might be more streamlined, but streamlined discrimination is still discrimination," CCR Bertha Justice Institute Fellow Noor Zafar told CBC News Network last Wednesday. CBC was one of several news outlets that sought out CCR in the wake of Trump's second attempt at the unconstitutional ban and our immediate response to it. "The repackaging of Trump's Muslim ban does nothing to undo its fundamentally repugnant character as an act of state-sponsored bigotry," we said in a statement released minutes after Trump signed the executive order. We pointed out both the immense harm the first ban directly caused for tens of thousands of people and the spike in anti-Muslim harassment and violence, noting, "State discrimination inevitably sends a signal of social acceptance for hate crimes and makes entire communities open targets to the nationalist rage Trump is fomenting." Other coverage included Al Jazeera English and the New Yorker. The White Nationalist House, CCR said in concluding its statement, "will meet continued resistance in the streets and in the courts." Last week the New York State Senate passed – without any debate – three bills aimed at undercutting Boycott, Divestment, and Sanctions (BDS) campaigns that are a growing part of the movement in support of Palestinian human rights. CCR and Palestine Legal immediately urged New Yorkers to contact their state Assembly members to ensure that companion bills do not pass the Assembly. "These bills are blatantly unconstitutional attacks on First Amendment rights to protest and dissent," the two organizations said in a statement following the Senate action. BDS efforts are part of a long history of non-violent resistance that includes the Montgomery bus boycott, countless divestment campaigns during the South African anti-apartheid movement, and more recently, boycotts against North Carolina for its anti-gay and anti-trans HB2 law. In fact, the same Governor Cuomo who last year ordered a state travel ban in response to the North Carolina bill less than a month later signed an anti-BDS executive order after bills similar to those just passed failed in the legislature amidst widespread outcry. CCR, Palestine Legal, and Jewish Voice for Peace have sought documents through the state's Freedom of Information Law to find out who was behind the unconstitutional order. The bills passed last week are part of a well-funded and coordinated wave of attacks designed to silence Palestinian human rights activism in the U.S. In 2015, Palestine Legal and CCR released a ground-breaking report, The Palestine Exception to Free Speech, documenting the tremendous reach of this effort. The Israeli government, meanwhile, has also stepped up its anti-BDS efforts. It recently passed a law barring anyone supporting BDS from entering the country. 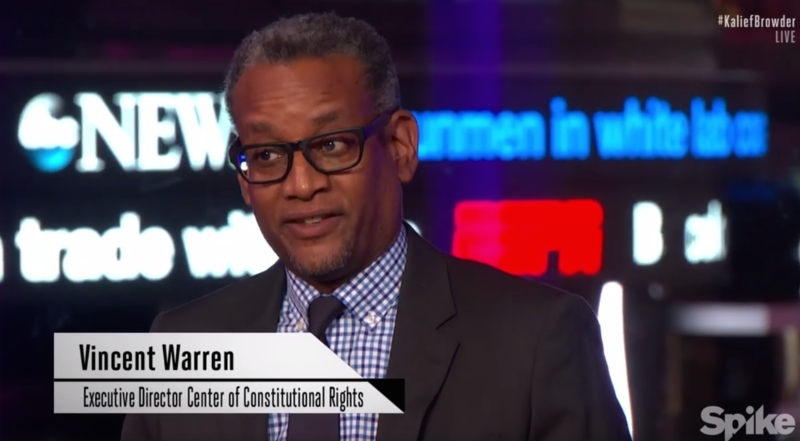 CCR Executive Director Vince Warren in "Time: The Kalief Browder Story." Last week CCR Executive Director Vince Warren was invited to be part of a town hall meeting hosted by Jay Z as part of the release of the documentary "Time: The Kalief Browder Story." "Time" paints a horrifying picture of our criminal justice system through the experience of one young man. Kalief was arrested for a crime he did not commit in 2010, was unable to pay the $3,000 bail, and spent three years in Rikers Island without ever being tried. Two of those years he spent in solitary confinement; he was also beaten by guards. Two years after being released, he succumbed to the mental injuries and took his own life. The town hall discussion highlighted the intersecting injustices that Kalief's tragic story surfaces: the discriminatory over-policing of communities of color, the violation of criminal defendants' rights to counsel and a speedy trial, and the draconian use of solitary confinement. CCR has been at the forefront of challenging these problems for decades, most recently through our landmark case against the NYPD's stop-and-frisk program and the case that ended indefinite solitary confinement in California. As Vince put it during the town hall discussion, "We can end solitary, we can end money bail, we ended stop and frisk!"